Cornwall is known for many things, from Cornish pasties, Cornish ice cream, and Stargazy pie; to folk music, seaside holidays, and surfing. As well as its own personality and character, Cornwall even has its own language. 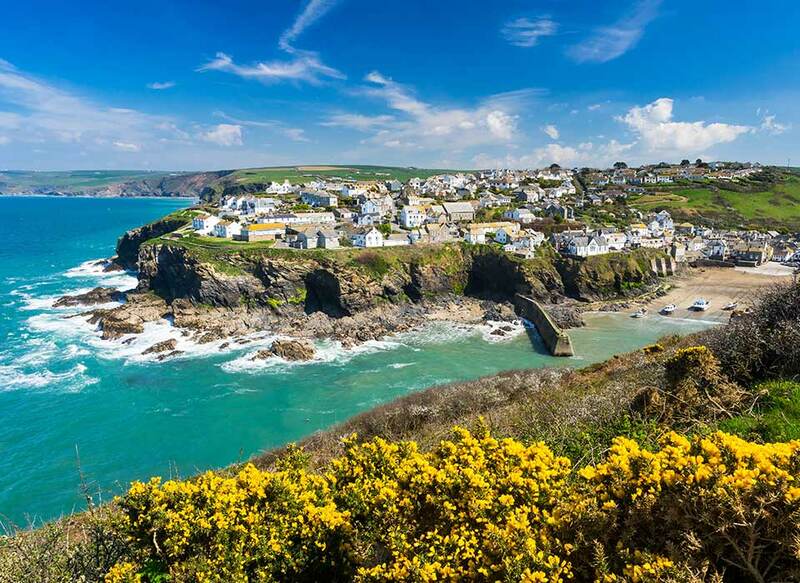 Cornwall has a distinctive coastline, where clear sea and pale sand merge seamlessly with rocky cliffs and grassy stretches littered with white cottages. But whilst it looks picturesque and tranquil, it is far from a sleepy seaside destination. Amongst the scenic coastlines and rural buildings, Cornwall has an effervescent side loaded with arts, culture, and exciting things to do. Much more just than plants, The Eden Project is bursting with things to see and places to explore. Plan to arrive early to make the most of your day; you may even want to visit a few times to see everything. You can’t visit The Eden Project without learning something new. Each area has been created with passion for the project and enthusiasm for sharing this knowledge with others. And it shows. Huge biomes simulate specific climates and provide the perfect environment for exhibitions about native plants and wildlife. Highlights inside the biomes include the Perfume Garden and the Giant Bee sculpture. The Perfume Garden is teeming with the most amazing natural scents from exotic plants. Each flower or plant has been thoughtfully chosen for its scent and its uses in aromatherapy. The Giant Bee sculpture, whilst impressive and decorative, also provides a talking point. The aim of the sculpture is to generate conversation and raise awareness of how important bees are in the process of pollenating the crops that feed humans. Whilst there is a lot for adults to explore and learn about, children won’t be bored either. 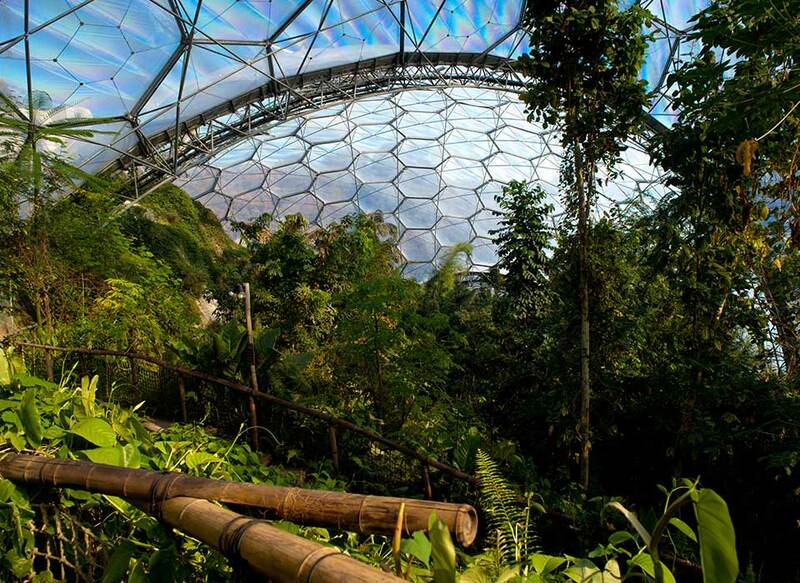 One of the goals of The Eden Project is to get kids playing outside and connecting with nature, and with the Nest climbing frame, a space themed indoor soft play area, and England’s longest zip wire, they won’t need much encouragement. Why leave your dog out? Dogs are welcome at the Eden Project, as long as they are kept on leads, cleaned up after, and not taken into buildings. There is an undercover dining area for dogs on the terrace outside the Eden Kitchen café, and best of all, they don’t have to pay an entrance fee. There are myriad places to stop for some lunch, a light snack, or a coffee. And you will be spoiled for choice with The Pasty snack bar, Med Terrace Restaurant, Eden Kitchen, Eden Coffee House, an ice cream parlour, a juice bar, and the Baobab bar. For an offsite alternative, there are some great pubs and restaurants within a couple of miles. The Holmbush Inn offers locally sourced, high quality pub food, or if you are in the mood for some fine dining, head to Boscundle Manor, which has been awarded 2 AA rosettes for its restaurant. The Eden Project is an educational charity with a strong sense of ethics, which carries into everything they do. Wherever possible, the cafés use sustainable, Fairtrade ingredients and products that have been locally sourced in Cornwall. Any food waste is recycled to create nitrogen rich soil enhancer for the plants. The Ethical Gift Shop continues this ethos, selling a selection of ethical gifts and souvenirs inspired by nature. Flambards Theme Park in Helston has a huge selection of rides, rollercoasters, and amusements. During peak season, you can easily spend a day outdoors riding the rollercoasters, log flume, swinging ships, and carousel. There is also an assault course suitable for children between the ages of 6 and 12 years, as well as Go Karts for ages 12 and up. For those who aren’t feeling quite so adventurous, there are also educational attractions such as the Exploratorium, featuring hands-on science activities, or the Jurassic Journey for dinosaur fans. Out of peak season is the perfect time to visit the indoor attractions at a reduced rate. ‘Indoor Attraction Only’ days feature several historical exhibitions including the Victorian Village, Memory Lane (vintage motorcycles and wedding dresses through the ages), Britain in the Blitz, and The War Gallery. 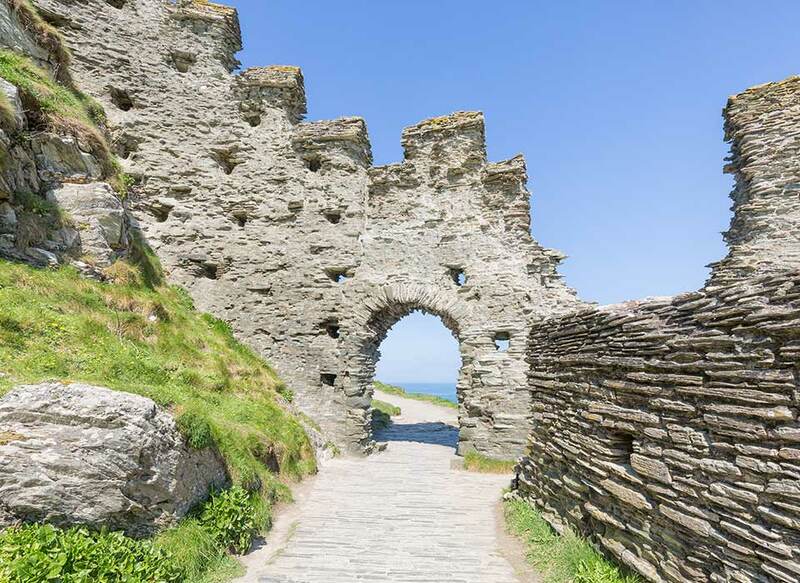 History enthusiasts and explorers will be in their element on a trip to Tintagel Castle. Tintagel Castle on Cornwall’s north coast dates all the way back to the Dark Ages. At the time, history was not recorded like it is today, so what we know of this era consists mainly of legends rather than reliable facts. As a result, Tintagel Castle is surrounded in an air of mystery. Although the castle has been linked to both Mediterranean trade and the legends of King Arthur, experts are unsure of the original purpose of the castle. The best place to learn more of Tintagel Castle’s mysterious past is the Visitor Centre. Having a good browse of the exhibition showing the castle through the ages will get your imagination going. Afterwards, head over to the Beach Café for a bite to eat; or make the most of the location by having a picnic on the grass overlooking the coast. Originally created as a garden for tropical birds, the gardens at Paradise Park have now become a feature in themselves. There are several themed gardens at Paradise Park, including a Butterfly Garden and a Bee Garden, as well as a series of linked ponds and streams. Home to beautiful exotic birds, Paradise Park is filled with colourful parrots, toucans, and flamingos, as well as other rare animals such as red pandas, mini donkeys, and red squirrels. Visitors can purchase a small pot of nectar to feed the parrots, and there is even a Red Panda Experience, which allows you to feed, stroke, and make friends with the red pandas. Indoors, the JungleBarn play centre provides a place for excitable children to use up some energy, whilst the Otter Pool Café is a welcome rest spot for adults, serving cakes, hot and cold drinks, and full lunches. If the weather permits, the Jungle Express Train is a great way to see around the grounds, and the Paradise Island outdoor playground is a great place to play on sunny days. Cornwall’s climate is warmer than most of the UK, making its beaches hugely popular with both tourists and locals. Surrounded on three sides by water, the peninsula has a vast collection of beaches. Looking at images of Porthminster beach, you’d be forgiven for thinking that it was a holiday destination in Greece. Furnished with palm trees and light blue crystal water, if you’re visiting Cornwall for a Staycation, this is the beach for you. Popular with families as the water is clear and safe for swimming, you can pack a bag and spend the day relaxing at the beach, pausing only to refuel at the beach café. The views from Porthminster Beach even inspired the setting of Virginia Woolf’s novel ‘To the Lighthouse’. 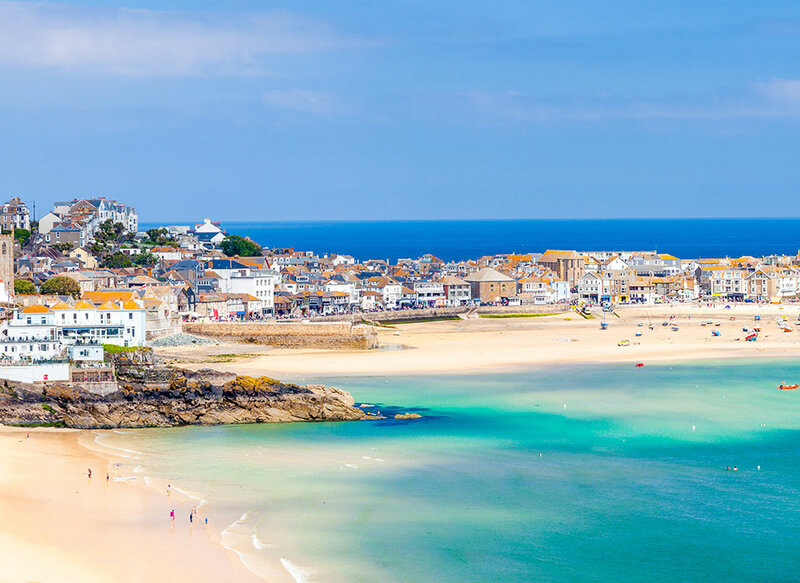 Only a short walk from the beach will take you to the centre of St Ives, an artistic town that is home to all manner of galleries such as the Desiree Hope Gallery, Tate St Ives, Porthminster Gallery, and Barbara Hepworth Museum & Sculpture Garden. Polzeath Beach in Newquay is a favourite destination amongst surfers, due to its consistent slow breaking waves. Other fans of this beach include dolphins and seals, and if you’re lucky enough you may just see one make an appearance. As Polzeath is such a popular beach, there is a seasonal dog ban from Easter until 1st October. The beach can get busy during peak times in the summer months, so arrive early to secure a parking space. Cornwall’s rocky cliffs have a softer feel around Holywell Bay, where the coastline is padded with patches of grass. If you visit Holywell Bay when the tide is going out, you may be able to discover Holywell Cave. Hidden in the southern cliffs of Kelsey Head, Holywell Cave is a limestone grotto, streaked with tinges of red and blue. Care should be taken around the cave, as the rocks can be slippery. Dogs on leads are welcome all year round on Holywell Bay beach, so it’s the perfect place to go for a long walk. Adrenalin Quarry is a perfect example of the side of Cornwall that can take you by surprise. With the slightly terrifying slogan of ‘throwing people off cliffs since 2009’– Adrenalin Quarry is not for the faint hearted. But for those who are willing to step out of their comfort zone, it presents an incredible opportunity to try a once in a lifetime experience that you will remember forever. Experiences include riding a zip wire off a cliff, swinging over a cliff edge on a giant swing, axe throwing, coasteering (wild swimming and climbing), an inflatable human catapult. Or if that’s not enough, you could always try The Widowmaker– the UK’s highest supervised jump at 33ft. Afterwards, congratulate yourself on your fearlessness with a traditional Cornish pasty or a locally made Cornish Ice Cream. If you do try any of these experiences, you are much braver than we are. Send us a photo or video on Twitter or Facebook so we can live vicariously through you. To see different types of events, browse our listings for What’s On in Cornwall. Browse below for the latest events in Cornwall.